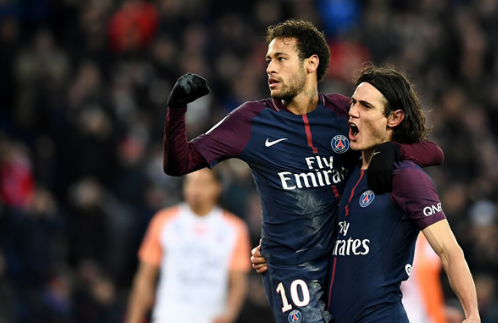 Edinson Cavani insisted that he is happy playing with Neymar at Paris Saint-Germain, after the Uruguayan broke the club’s goalscoring record and his strike partner netted twice against Montpellier on Saturday. The 30-year-old is PSG’s top scorer this term with one more goal than world-record signing Neymar, who returned to the team for the first time since being booed after taking a penalty that could have given Cavani the record in an 8-0 thrashing of Dijon on January 17. But Cavani gave Neymar the ball to take a spot-kick in Paris on Saturday, and also set up the Brazilian to score his second late on and complete a 4-0 rout. “He (Neymar) has done a lot and is doing a lot for the team,” Cavani told Canal+, after Neymar’s first appearance since scoring four goals against Dijon. Cavani broke Zlatan Ibrahimovic’s all-time PSG record by tapping in his 157th goal for the club. The Uruguay striker had levelled Ibrahimovic’s previous mark of 156 goals 10 days ago, and turned home Adrien Rabiot’s cutback in the 11th minute at the Parc des Princes. Cavani celebrated the record by throwing his shirt into the crowd, receiving a booking after shaking hands with the referee and having to take a new jersey from the bench. “It’s something magnificent, I’m very emotional,” Cavani added. It was the 30-year-old’s 27th goal for the Ligue 1 leaders in all competitions this season. Cavani has now scored 157 goals in 229 matches for the capital side since joining from Napoli for 64 million euros ($79.5 million) in 2013, while Ibrahimovic managed 156 in 180 games during his four seasons in Paris before leaving for Manchester United in 2016.